In Western countries, cows are anything but sacred, but who would have thought cows today are little more sacred in India, too? 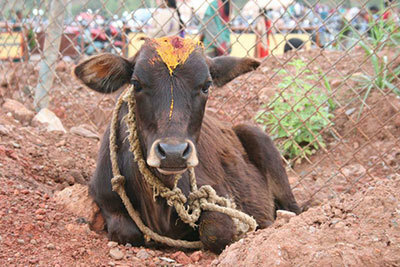 A male calf abandoned by their owner at a temple. In the Western world, typically as soon as a dairy cow's prodigious milk output drops off, she is sent packing – to the meatpacker. There, her tough old body (old and worn beyond her young years) becomes hamburger, sausage or mystery meat. During her four or five years as a commercial milk production unit, all her newborn male calves had been forcefully taken away from her within days or hours of birth to become veal or breeding stock. It's a cruel and tragic life story. But it's not necessarily much better in India. In India, cows are sacred, in principle, to the dominant Hindu population (80 percent of Indians), but this reverence is often expressed in words alone – even fine laws and regulations. Thus, cow slaughter is illegal in all but two of India's 29 states (these are states where non-Hindu Indians who eat meat are prevalent). Even buffalo – another major milk provider – which is no more sacred in India than in Montana, is legally protected from slaughter in most states of India. But there's a catch. India’s anti-slaughter laws do nothing to prevent spent cows and buffalo (and surplus calves of both species) from being shipped to other states (or countries) where it is legal to slaughter the poor animals. 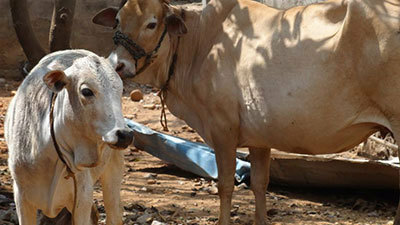 An "Indian Breed" cow and her calf, rescued from slaughter. But there's another catch: there are laws to at least ensure the animals are transported under relatively humane conditions. For example: a veterinarian must check each animal and certify that she is fit for transport; to prevent overcrowding, only a limited number of animals can be loaded onto a truck; and animal welfare officials must accompany the trucks to the abattoir. 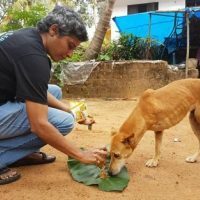 Unfortunately, there is one more catch: In India, animal protection laws are made to be broken, and just because a law is in place, does not mean it is enforced. Often , four times the maximum allowable number of animals are loaded onto a truck. 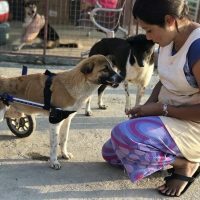 And that trip can be hundreds of kilometers in stifling heat, with no food, water or rest breaks for the suffering animals. To cover the animal abuse, the truckers often tie the cows by their legs, forcing them to lie down – sometimes in a crushing pile-up – so a tarp can be thrown over the horrible sight, allowing the truck to pass through towns and cities without raising eyebrows or alerting authorities. Stopping the system and changing the culture that permits slaughter is a slow work in progress. And more needs to be done to stop the problem at its source: the demand for milk, ghee, paneer and other dairy foods that are, arguably, more sacred in India than the cow herself. In the meantime, we are seeking to develop economically sustainable village goshalas (cow shelters). The income generated from cow dung biogas (a carbon-neutral energy source) and urine distillation products (widely believed to be medicinal in India) is an incentive for the farmers to put their retired dairy cows out to pasture instead of selling them for slaughter. But even dairy cows fortunate enough to live their full lives in dignity can't prevent the slaughter of their surplus male calves. Given the grand scale of dairy production in India and its detrimental effects not only on animal welfare but on climate change, it's hard to imagine a humane alternative short of transitioning to an environmentally sustainable, animal-free livelihood for Indian farmers and eaters alike. This is a task generations in the making, but it must be started now. 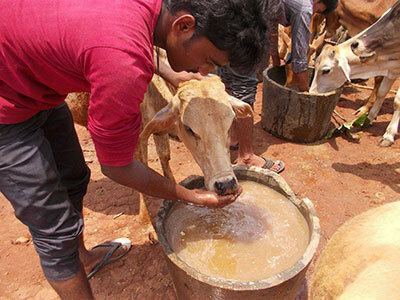 You can be part of the solution by choosing a vegan diet wherever you live (India's dairy industry is so large, it exports to the United States, Canada, Europe and beyond), as Help Animals India board member Jessika Ava writes in a recent report), and by supporting our work.